During an escape attempt, a career thief learns that his cellmate once hid stolen treasure under the floorboards of an old lady’s house. After tracking down the location, tucked away in a dark and gnarled forest frequented only by weary pilgrims, it is abundantly clear that the whole hamlet is creepy. There are only six citizens, all elderly, sepulchral and suspicious, and they clearly have ill intent of their own in store for anyone they can trick into staying the night. Our roguish hero is too busy sneaking around in the moonlight with money on his mind to fall into their initial schemes, but he’s doesn’t escape unscathed. He eventually unveils the town’s dark secret, but in the process gets cursed by a mysterious ghost parade. His only hope of rescue come from an unlikely quarter. 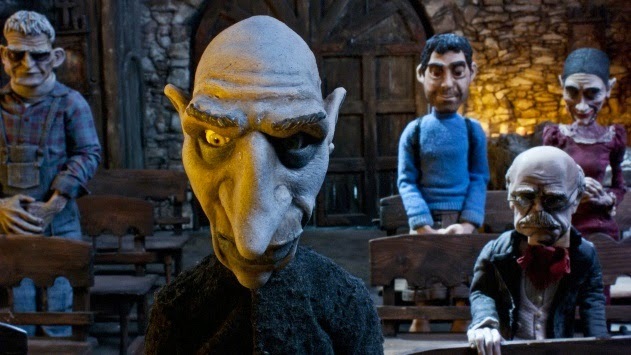 I love stop-motion, and if you also love stop-motion then go ahead and stop reading this review and make plans to see The Apostle. The character design conveys a lot of personality, the miniature sets are rich with gothic detail and the director sprinkles in some interesting 2D and CG animation sequences to mix things up. You won’t be disappointed in the way this film looks. Unfortunately, the story isn’t nearly as full of life and imagination. It has the feel of an old folk tale or classic ghost story, which while that lends it an air of timelessness, it also means you’ve heard this one before. It’s a little too simple and straightforward for my taste, and it often feels like the pacing drags just to stretch things to the feature length 70 minute mark. The villagers are so obviously evil, their machinations so easily overturned (half a dozen geriatric innkeepers, barkeeper and a priest just aren’t that much of a threat, especially to a strong young thief) and their secret so run-of-the-mill that it will be tough for adult audiences to get very invested. And yet it might be too scary, thanks to the impeccable production design, to be a safe bet for little kids. That said, the right type of kid (or adult) will love this movie, and I hope it finds its audience.